Typically we start seeing Woolly Bear caterpillars in October, when they are searching for sheltered spots in which to spend the winter as larvae. 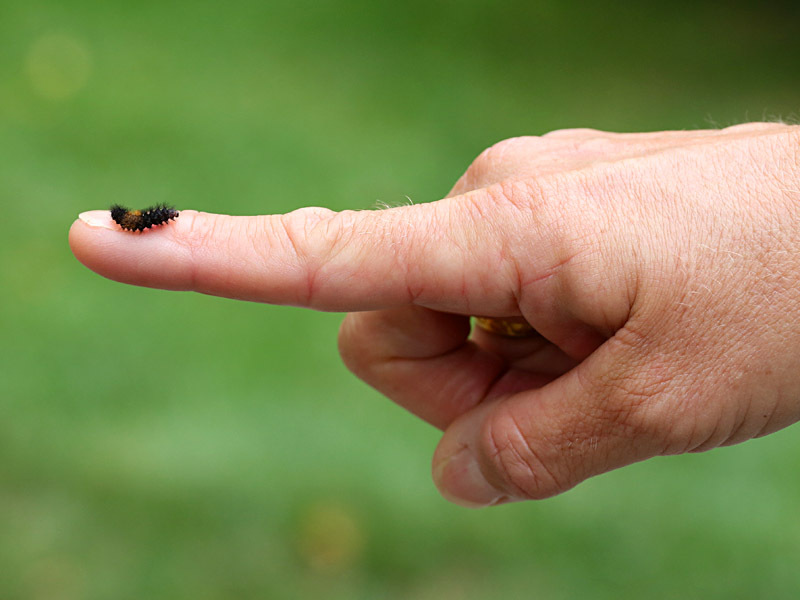 With only two months between now and then, it came as a surprise when my great nephew and budding naturalist Eli Holland discovered a very young Woolly Bear recently. It turns out that in New England, there are two broods of Isabella Tiger Moths (whose larval stage is the Woolly Bear). The caterpillars that hibernated last winter emerged from hibernation this past spring, pupated, transformed into adult Isabella Tiger Moths, and proceeded to mate and lay eggs. It is these eggs that have recently hatched, and the Woolly Bear caterpillars that are no bigger than the length of your baby fingernail right now will be eating dandelions, grasses, nettle and meadowsweet nonstop for the next two months in order to survive the coming winter.